Saturday, May 6 was a very special day for Maria Lanka, a Killington loyalist from Long Island, N.Y. On the same day as the exciting 143rd Run for the Roses at Churchill Downs in Kentucky, Lanka for her first time ever, set a record and was inaugurated with friends into the the Killington 100 Day Ski Club. This was an incredible personal achievement for Lanka. Exactly six weeks earlier she broke her right wrist skiing. However, Lanka was focused on reaching the elusive 100 day mark. She continued skiing with a cast and one ski pole, determined to persevere and be able to still reach her challenging personal best ever quest. Lanka is the 200th member of the Killington 100 Day Club this season. 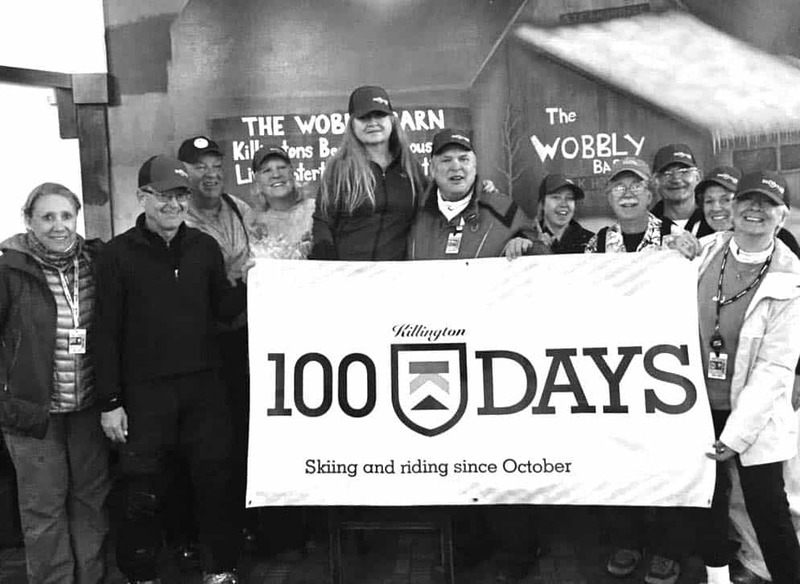 Maria Lanka—elevated— stands with friends celebrating her tallying 100 days this ski season at Killington.